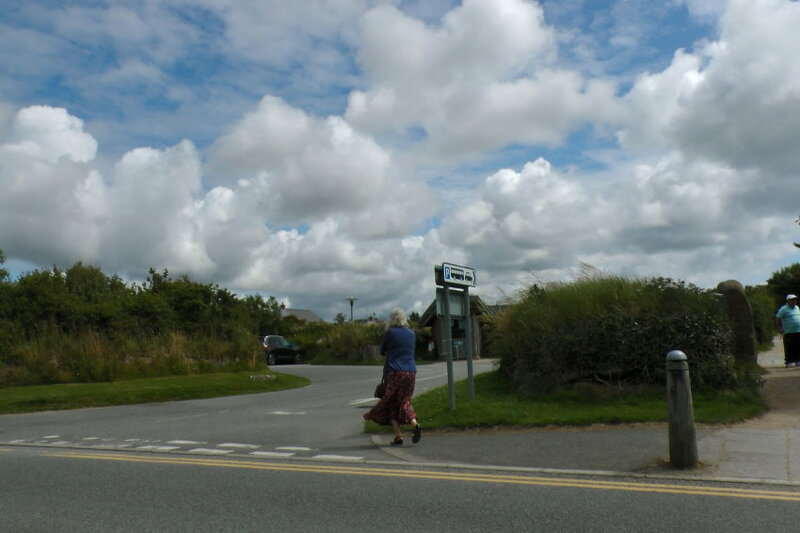 Like much of the UK, this part of West Wales had a July of huge extremes – the hottest day of the year at the start of the month, then a steady decline to one of the coldest July nights ever. 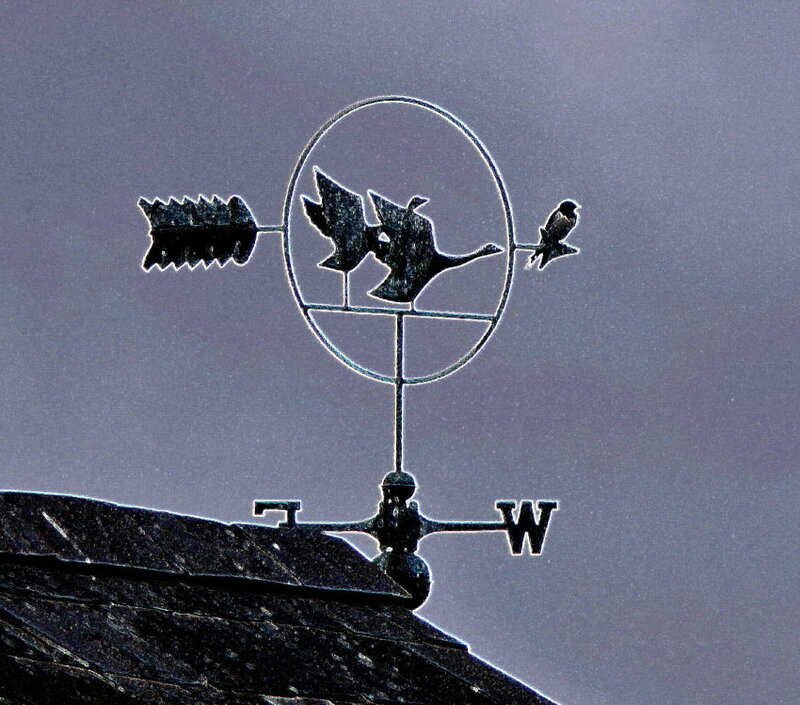 I don’t record temperatures, but the Met Office July highlights blog has temperatures of about 2 degrees C from Exeter Airport (click here), and barely 20 miles away Keith Brown at the wonderful Cilgwyn Lodge gardens, click here, recorded the same low figure, on a clear night at the end of July. As the near full and blue moon rose above fields still lit with dipping golden sunlight, and temperatures fell away, Lavinia chose to deliver her late, and bonus, lamb. 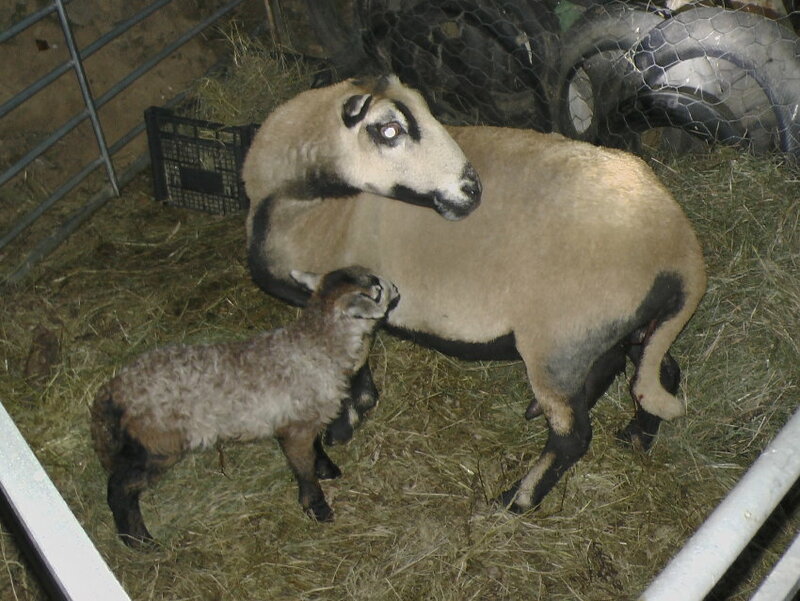 Entirely unexpected, since she’d been raddled in three different colours, and 3 potential delivery dates had been and gone – though frankly we knew from her appearance and behaviour that she wasn’t going to lamb in spring. But with our smallholding’s limited grazing options, the ram had been left with the ewes. So after shearing we started to have a good look at her enlarging abdomen and udder. She’d clearly heard our mutterings that as our oldest ewe, and having been barren this year and last, her days were numbered, and had a late fling with Doublet. Interestingly the fact that she’d had 3 previous recorded mating days enabled us to pinpoint her cycle length pretty accurately at about 16.5 days, and so estimate possible due dates – which she exactly achieved at dusk on July 31st. Another lovely ewe lamb arrived with no problems and is now struggling to remove enough milk from Lavinia’s almost bovine sized pendulous teats, so some initial milking out has been necessary to relieve the pressure. Fiona has the knack for this and the compliant (and possibly Valerian influenced – see later) Lavinia will stand still and within no time Fiona single handedly has 400 ml of thick frothy surplus milk in a jug. An equally ‘out of the blue’ phone call enquiring about our silk scarves saw us nipping down to St. David’s a few days before this unexpected arrival. 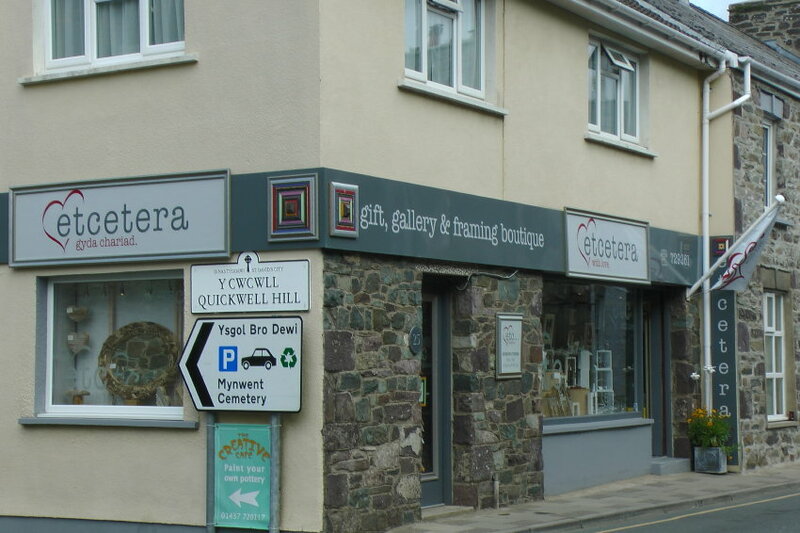 We’re delighted that Jane, from the lovely ‘Etcetera’ gift and framing shop, has decided to stock a selection of our silk scarf designs. We were sorry we couldn’t linger longer in this attractive town at the South Western tip of Wales, which had a real buzz about it, but we did manage to explore for the first time the Oriel y Parc building, just outside the town’s Eastern edge. 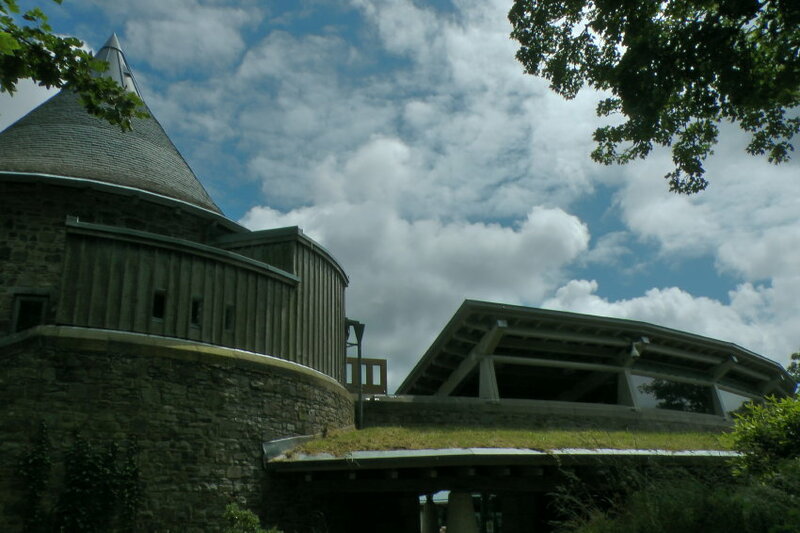 A masterpiece of contemporary architectural design, even the extensive ashphalted car park is cleverly and completely screened by the simple device of using low wild flower covered stone banks, breaking up the serried ranks of vehicles. 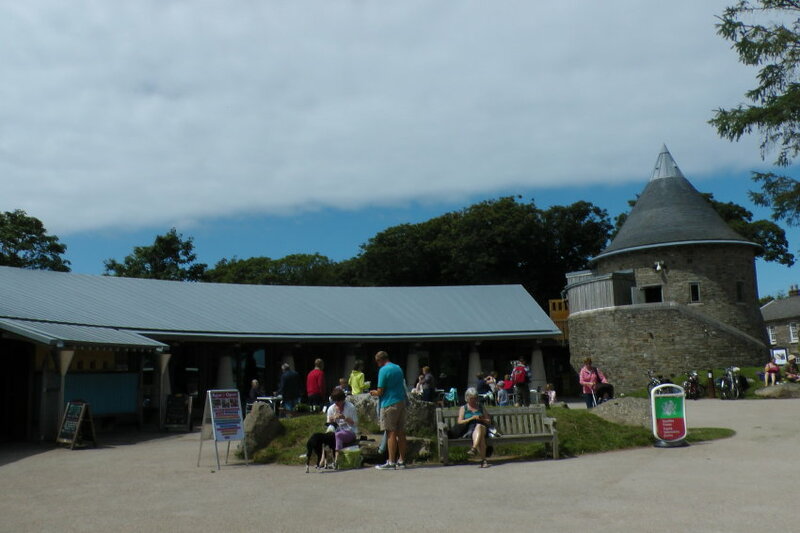 The curving main building which contains shop displays, exhibition spaces, and is also home for an information centre for the Pembrokeshire Coast National Park is a fascinating space, and I’m sure has raised St. David’s visitor numbers hugely since it was built. Way before this award winning building was even dreamed of, in 1977, Fiona and I had borrowed Dad’s camper van and parked up in the small car park on this very same site. And had the space to ourselves! Click here for a link to the site’s website. 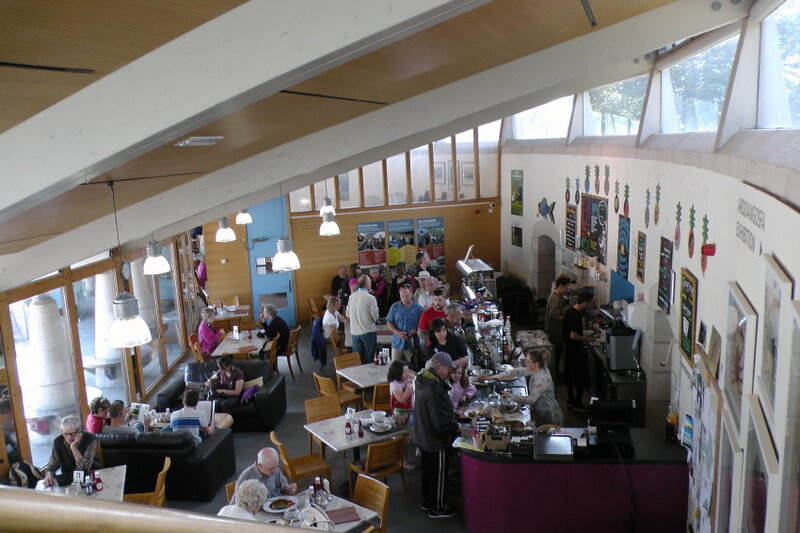 But we’d nipped in to sample the cafe for a quick lunch before heading home, having read good things on Trip Advisor. The food was brilliant – freshly produced on site, the space was fun, light and and airy, and in spite of huge queues, the service was amazing. Not knowing, we’d commented to our ‘young waitress’ who was processing the vast numbers of customers, with friendly banter, and a smile, that she was a model employee for the hospitality business – it turned out that she was indeed the manageress! 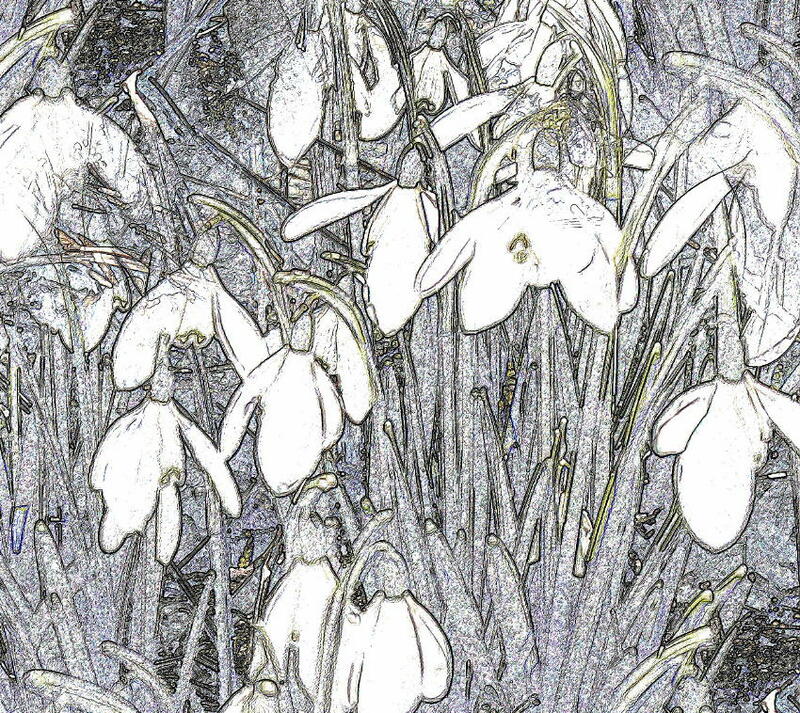 Back home our scarf numbers are now sufficiently depleted for us to need to organise another print run… (Snowdrop)... And so time for some new designs to be created…. 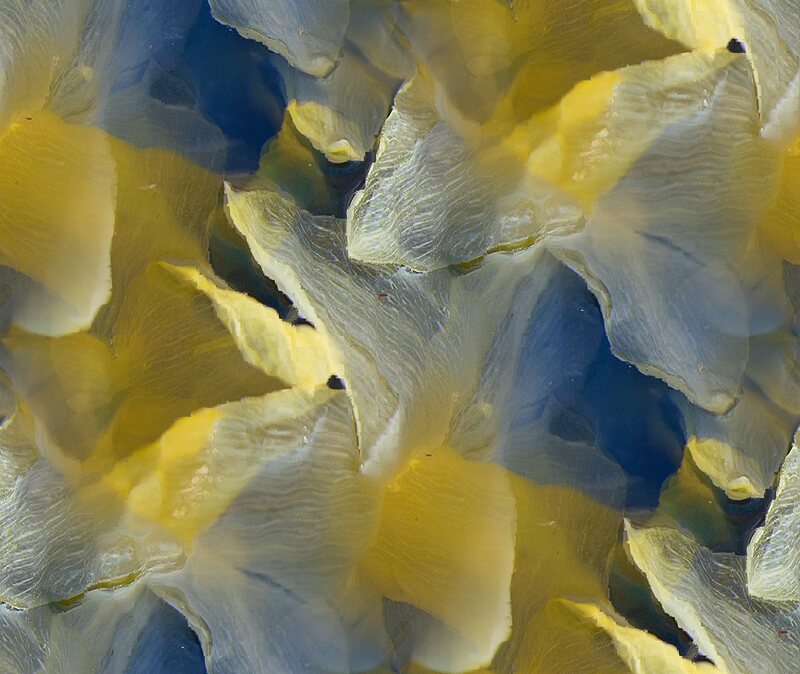 (Daffodil)… When we first tried doing this years ago, we thought it would be a doddle. 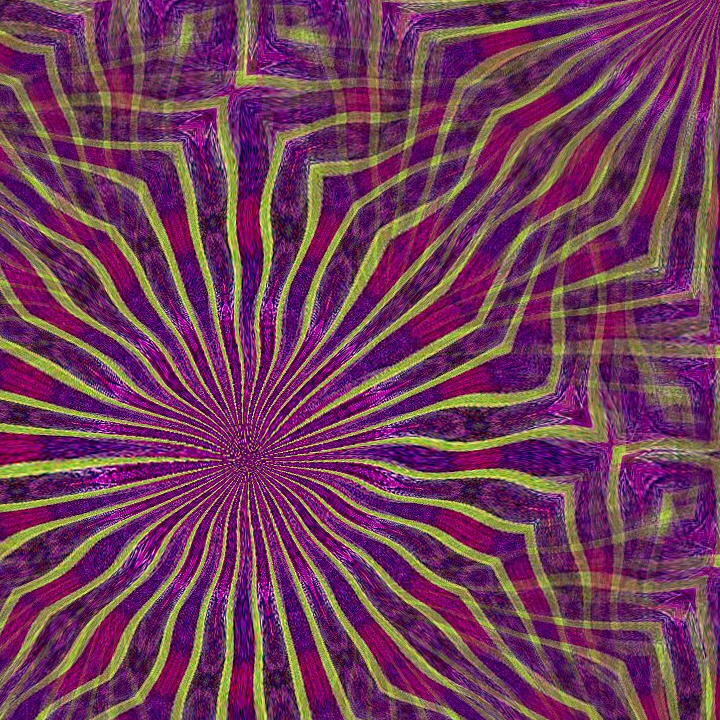 Start with a nice photo, do a little bit of tweaking, bulk it up into a 300 MB file, and hey presto… (Clematis – ‘Star of India’) … In fact it’s very time consuming, and whilst mentally stimulating when it works, many times it doesn’t, or even worse I think it looks brilliant, but it is rejected by Fiona. Instantly. Or vice versa. 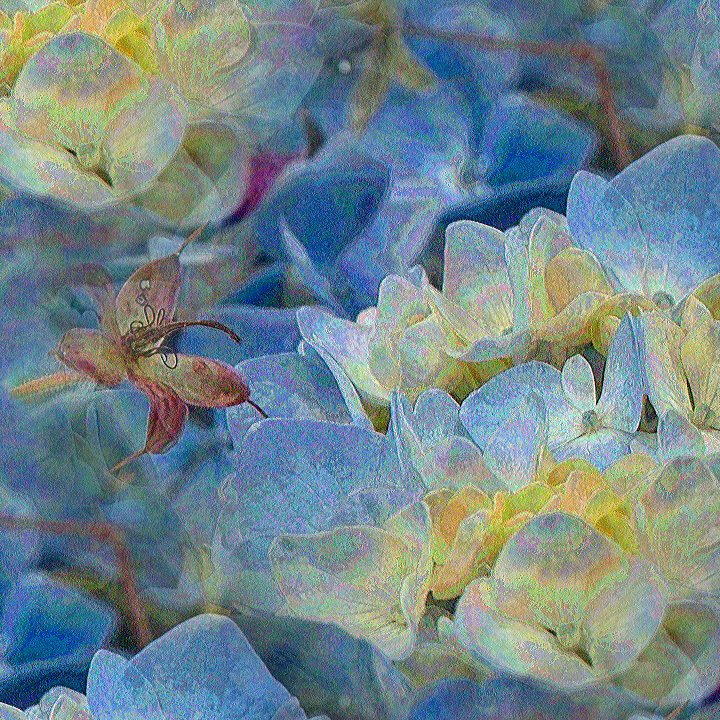 (Hydrangea)… Anyway, included here are some of the new (and at much reduced quality and cropped, for anyone thinking of using them!) 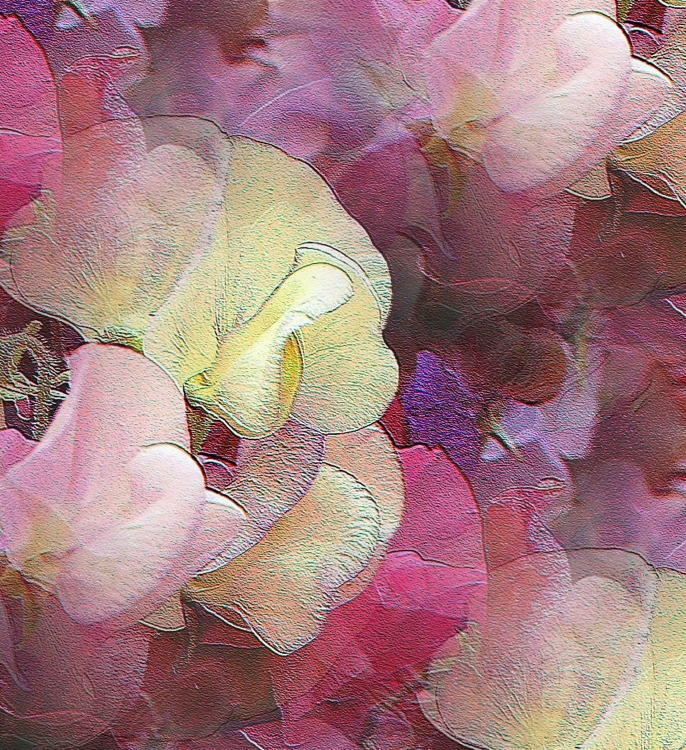 design blocks which may make it into the next printing run, which we hope to have ready by around mid September… (Sweet Pea)… It would be interesting to hear from any readers whether they have any real favourites or hates from this mixed bag, which each started off as a single photo taken in the garden. (Astilbe and Hydrangea)… When I first started really looking at which garden flowers seemed to appeal to local pollinating insects years ago, I realised that at this end of July, cultivated forms of Betony, Stachys officinalis, were some of the best… What was even better, was that the form and colour ranges seemed to fit in with our planting preferences. So starting with a couple of plants of Stachys ‘Hummelo’, and another form selected by Richard Bramley at nearby Farmyard Nursery, we’d made our initial plantings. After checking that they survived long term in the poor conditions here, and weren’t savaged by either slugs, or rabbits, we decided to bulk them up, but not wanting to wreck the initial plantings too much, opted to do this by seed. The consequence has been that it’s taken about 5 years to start to achieve any real impact. But as always the big plus of growing more plants from seed is that you get a range of heights and vigour, as well as nuanced colour shade differences. And now that these are dotted around the effect is much more naturalistic. 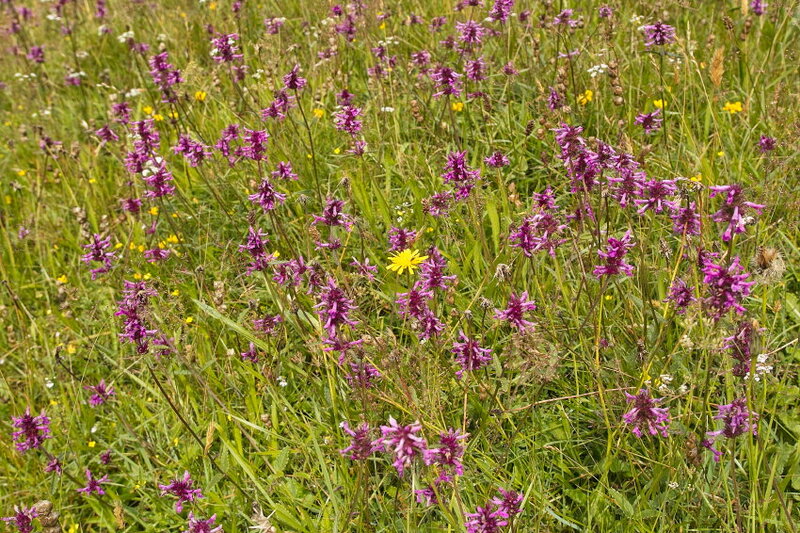 But I have to say not yet in the league of the displays of native Betony in one section of the Cwmdu meadows which I’ve mentioned here before. 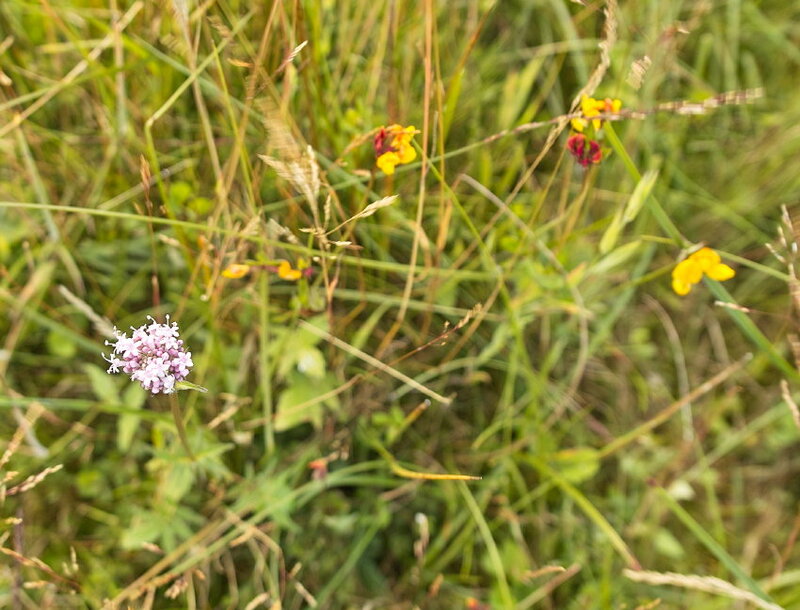 On a South facing, and drier section of one meadow, they form a carpet of rich purple, amongst the fading straw of grass seed heads, and few remaining yellow Birdsfoot Trefoil, Cat’s Ears and white Whorled Caraway flowers… Although native Betony is much lower growing than all of my seedling forms, the effect en masse is stunning. But what about its ‘officinalis‘ species name? I didn’t know until a few months back that any plant with this word as part of its nomenclature suffix had recognised medicinal, or herbal properties. 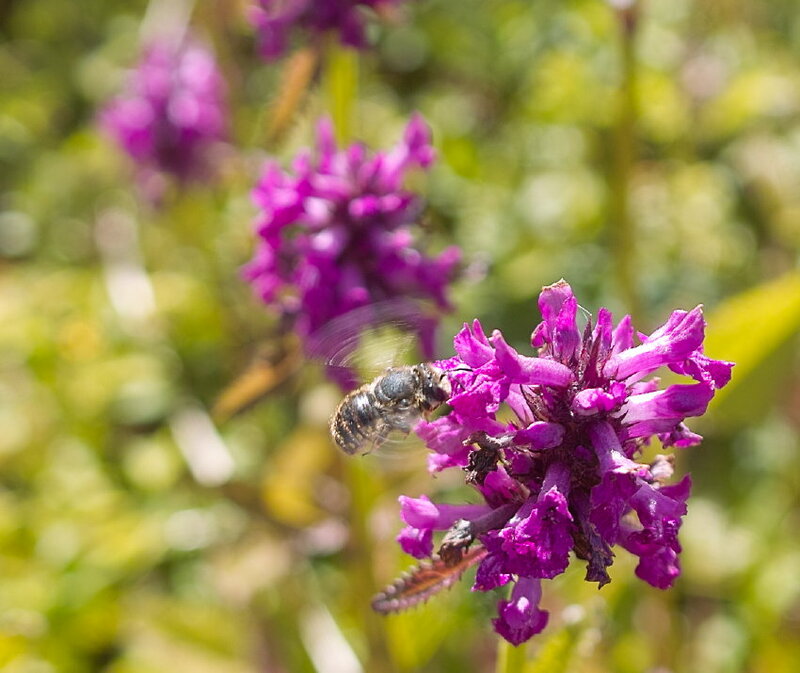 For further thoughts on what these beneficial effects might be in the case of Betony, click here, and here. 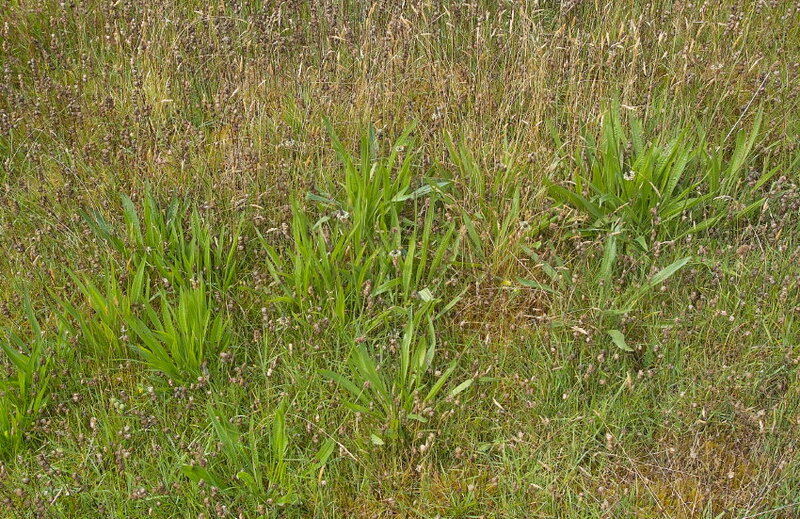 But what about the effects on livestock grazing these herbs, or ingesting the leaves in hay? Or indeed on the insects gathering nectar from it? Has anyone even researched the effects of anti-inflammatory, or other drugs on insects? Or is it just those agents that kill them effectively, which have been studied as having commercial value? It has dawned on me very late in the day as a retired veterinary surgeon, that we received no tuition at all on the possible medicinal value of different constituents of grazed herbage to the animals on these pastures. In part this was because the then, (and still? ), prevailing approach was to maximise yields by minimising the selection of plants growing in pasture to just the most efficient producers of greenery, protein and carbohydrate and if problems in any stock which grazes such fodder develop, then to medicate with synthetic additions, or supplements. Years ago I attended a multidisciplinary symposium at London’s Royal Society of Medicine in Wimpole Street, on current developments in analgesia. And was somewhat surprised to hear from the medics then at the cutting edge of human pain relief research, that no new drugs had really improved on the analgesic properties of morphine. 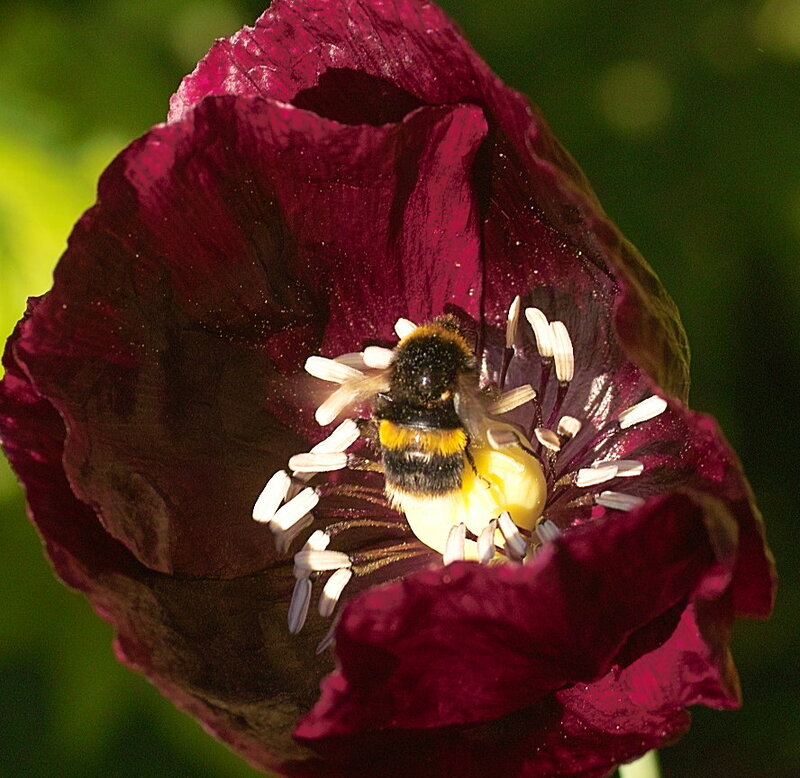 Which is, of course, derived from the Opium Poppy, and has been in use for centuries… I did wonder at the time how it is, or why, such wonderfully analgesic chemicals are sitting in the sap or leaves of plants which can be easily grown, and harvested for our benefit. And what benefit, if any, such chemicals are to the plant. There are huge historical knowledge bases around the world particularly in the Far East, but also in Europe, which most in the West have neglected over the last century, of native plants with significant beneficial pharmacological actions. Click here for a fascinating recent investigation based on Austrian folk medicine, where a range of plants (63 different species) with reputed anti inflammatory actions, had extracts from their tissues subjected to the range of contemporary in vitro trials used to assess the efficacy of pharmacological chemicals. 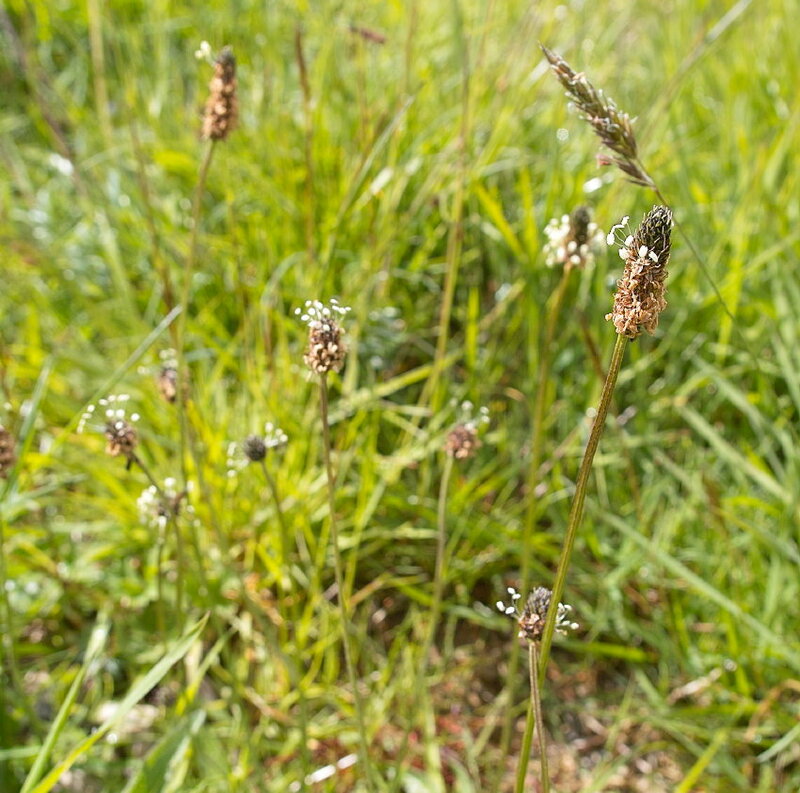 Trawl through the details for some of these plants, and you will find, for example, that in the data on Ribwort plantain (Plantago lanceolata) shown above and below, in certain tests the leaf extract had anti-inflammatory action equal to hydrocortisone, phenylbutazone and diclofenac-sodium – all potent and commonly used anti-inflammatory ‘drugs’. I’ve been meaning to write about this subject for months, since I find the idea of the possible health effects or benefits of animals grazing such common native plants hugely exciting. But its a vast topic, and one I shall have to return to. But for now, a synchronicity of ideas and news means I shall mention one other plant with known herbal and pharmacological activity. I was researching the biochemistry and mechanisms of wet hay decomposing and eventually causing hay fires (a topic of relevance this year) when I discovered by chance, that as from June 2016, farmers will not be able to buy commercially viable quantities of rodenticide without a certificate of competence. Click here for more. So this joins mole control chemicals, transporting of stock over 30 miles, and the use of pesticides/herbicides as another area where landowners will be required to attend a course, and sit a test (all at considerable expense), before access to previously widely used materials is allowed. 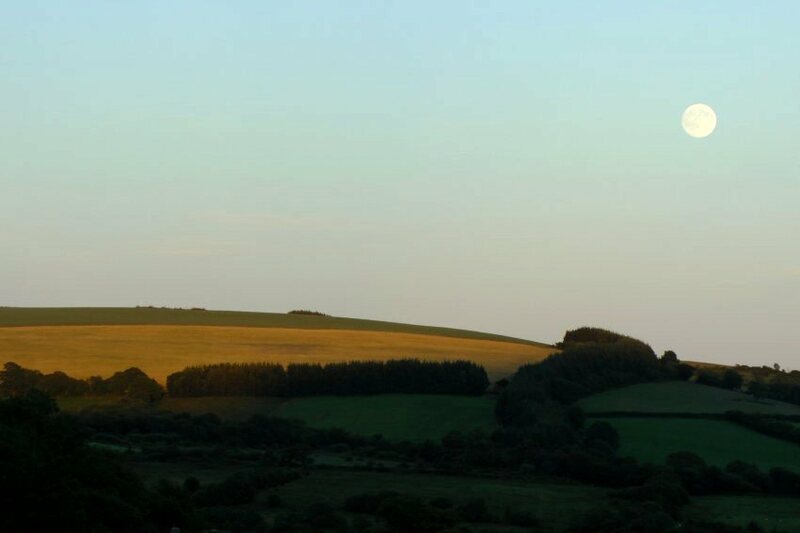 I’m sure there are worthy arguments for all this additional paperwork – not least the extra employment opportunities which will be created, but the reality is that few small landowners will take this route. Without such paperwork, there will be no alternative to calling in a ‘professional’ to do the job – again unlikely, since there are such tiny, or non existent margins in upland agriculture. So as always, I wondered about the most effective baits for rodent traps, since rats are an omnipresent issue around farm buildings and livestock feed. And discovered that there are many references to the roots of common Valerian ( Valeriana officinalis – there’s that word again), being used as a rat attractant or bait, and in particular, the inclusion of it as part of the Pied Piper of Hamelin’s technique for luring the rats away from the German town, all those centuries ago. Along with his magic pipe playing. For those who would suggest a farm cat, whilst that would be an option, I’m sure there would be significant collateral damage on our local bird population from this – an example that there are no easy solutions to any of these issues. 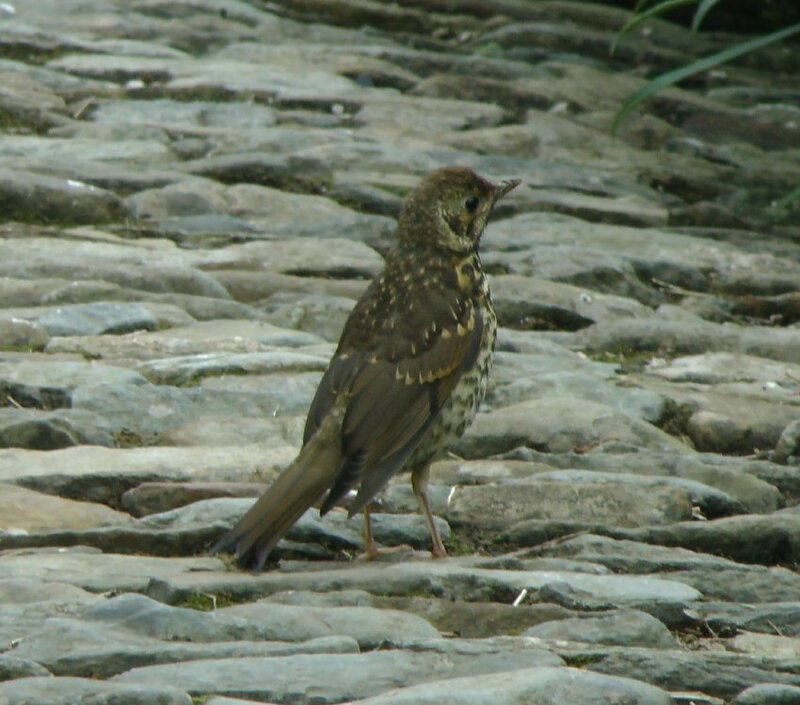 Below is one of a number of young thrushes who have frequented our cat free garden this summer, and helped with our snail control, whilst seeming quite unconcerned by our presence. Click here for a fascinating insight into the possible explanations of the subsequent disappearance of the town’s children, after the mayor had refused to pay the piper, or rat catcher, for ridding the town of the plague of rats. 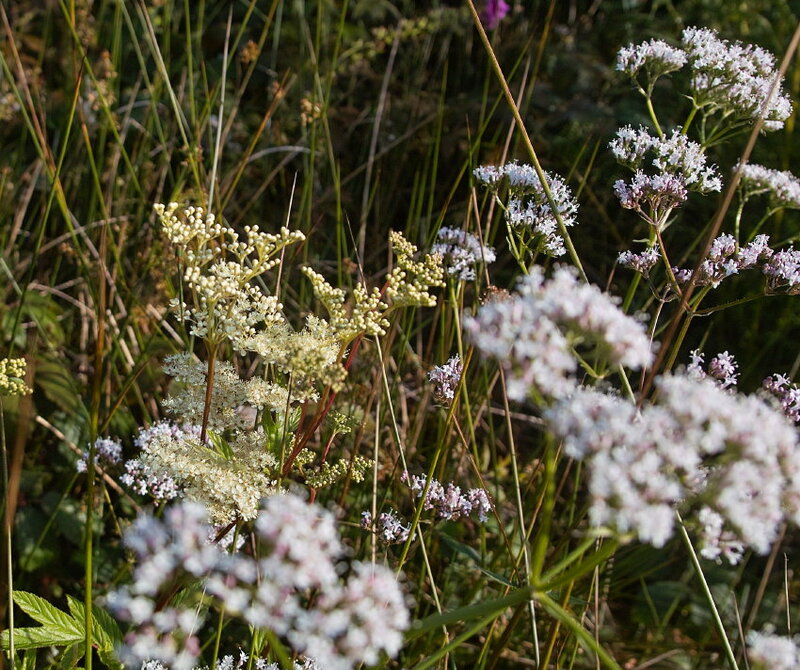 But when the plague of rats starts to take over in the surrounding fields, at least we have plenty of Valerian to hand…. 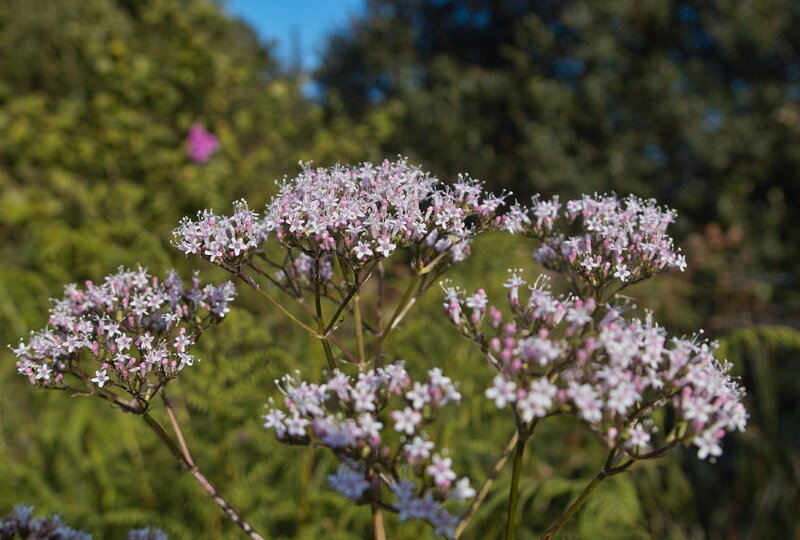 Unfortunately, the roots are reported to smell like dirty socks, but when in flower, a mass of the pretty Valerian flowers has a strong scent not dissimilar to Vanilla. Apparently the plant has a huge number of pharmacologically active ingredients contributing to well known sedative and anxiolytic effects – mainly derived from root extracts. The plant has been called ‘all heal’ during the past, such was its recognised role in herbal medicine, and the widely prescribed ‘tranquilizer/sedative’ diazepam probably got its first Valium trade name, as a nod to the plant’s similar effects. Click here and here for more on Valerian’s pharmacology. The other point again is what effect does grazing off the Valerian have on our small flock of sheep? Is this why, in the main, they are so well behaved? Whilst the odd plant makes it to flowering, most are grazed off to a low level, in our extensive, rather than intensive, land management. And if the resident swallows ingest some of the insects which use the plant as a larval food, will any of the active ingredients be concentrated in this higher life form and alter behaviour, or create delusional ideas? This entry was posted in gardening, Meadows, nature, photography and tagged Cwmdu Meadows and Betony, Ethnopharmacological in vitro studies on Austria's folk medicine, Gelli Uchaf garden, Oriel Y parc Cafe st. Davids, Plantago lanceolata, Ribwort plantain, Stachys officinalis - Betony and herbal properties, Valeriana officinalis by thegardenimpressionists - Julian and Fiona Wormald. Bookmark the permalink. 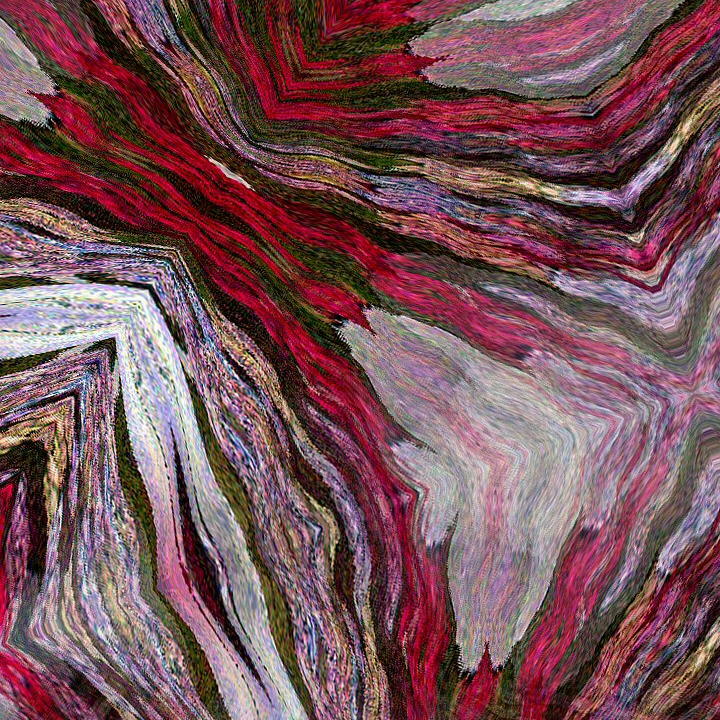 I really like the new scarf designs, clematis would be my favourite. How amazing they started off as single photos taken in the garden. Really good stuff. 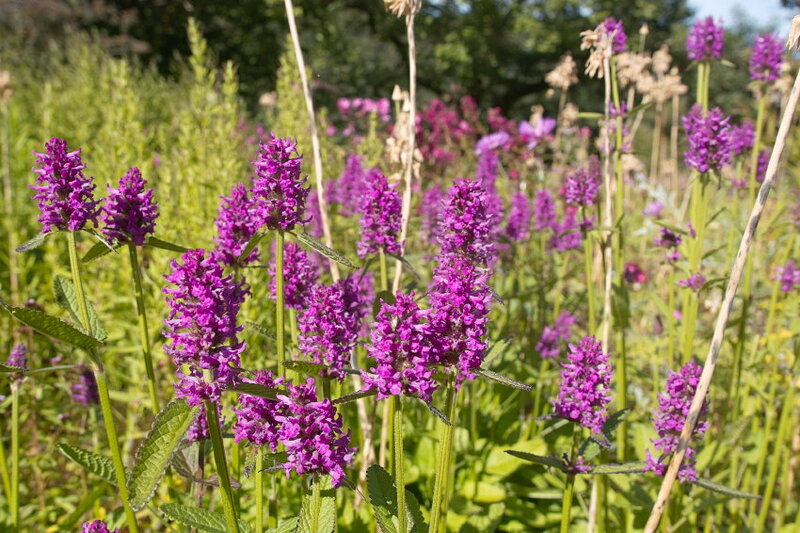 Love the betony meadow as well. Hello BW, Thanks for the comment and your favourite scarf design. We both really like the Clematis as well – quite different to others we’ve done, but the colours are very accurate for those in the flowers. 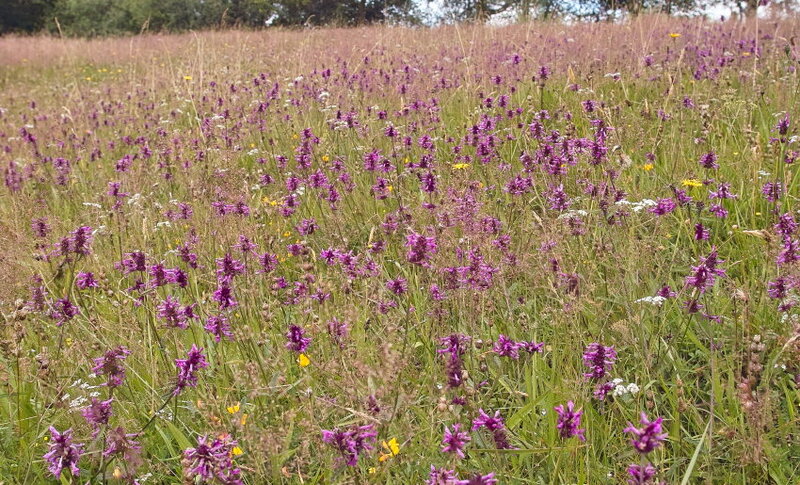 The Betony meadow/bank is really astonishing.You don’t see it at a distance, and then when close enough to appreciate it, a camera just can’t do justice to how rich a scene it is. Lucky you to have this amazing colourful place near you. Good luck with the scarfs! Thanks. The meadows are amazing – and so few people seem to know that they’re there, even though there are public footpaths through them – I think people are generally far too busy here to have time to go walking! Hello Julian, fascinating post as usual, so much to ponder and comment upon. I might leave the land management and paperwork discussion fo another day, but like you I probably spend as much time on the latter as the former! Interesting thoughts about the medicinal effects of various pasture plants on animals, on balance it is probably a good thing to offer a broadly diverse range of grazing/hay/silage, probably a bit like having a balanced diet. Have you noticed how certain animals have “favourite” plants, which they will always graze first. 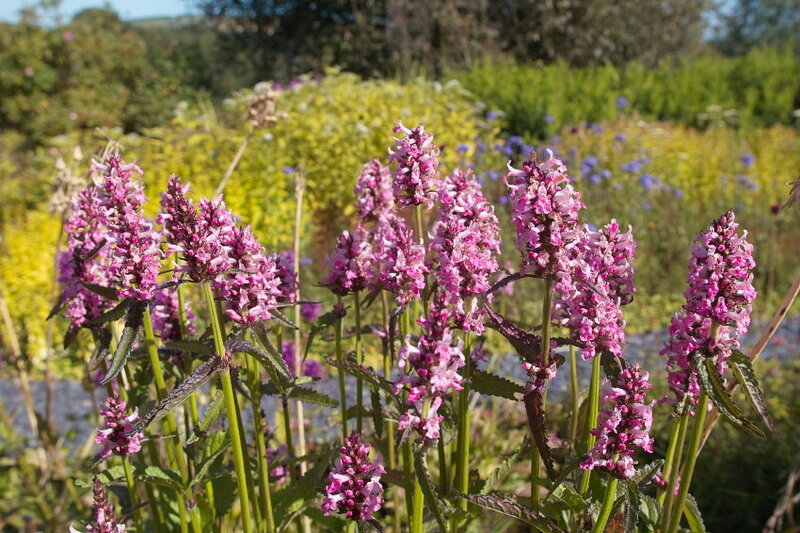 I’d not thought about trying Stachys in the garden, it is not native here but S. sylvatica and S. palustris are. I’ll try to find some seed and give it a trial. Lovely scarves, I particularly like snowdrop, daffodil and sweet pea. Your comments on the benefits of herbs in grazing for animals matches the suggestion I was reading about recently that the bees “use” the active ingredients from the pollen and nectar of such plants as Nicotiania in medicinal ways. However, this is not based on research but it is an interesting avenue. I wouldn’t be at all surprised if bees, and other, insects weren’t deriving much more than straight nutritional value from the nectar and pollen that they collect – today has been a little bit warmer and sunnier, and the very few insects about – mainly bumbles and solitary bees, are all on the Stachys flowers? Is it just because it tastes better, or are they utilising other active ingredients? Thanks for the comment about the scarves – we’ve always tried for a mix of design styles, and what sells well often surprises us! Lavinia and her lamb, I wish I had been there… 🙂 how can your pics be always so awesome!? Hi Julian, lovely post and much to learn for me including that you designed and produced your own scarves. They are all beautiful but Hydrangea is my favourite, I hope your new stockist does really well. I love the name of your older Ewe Lavinia. I did not know you were a retired vernally surgeon either, really interesting observation that essentially the effects of what was eaten was not studied. We are all more switched on to the effects of what we eat and our lifestyles too that it now seems obvious for animals too. Veterinary! Sorry that was spell check, is vernally even a word! Probably, since vernal is, I think …meaning relating to spring?? I never find the comments text boxes easy to use/check….